We have some feedback from you. 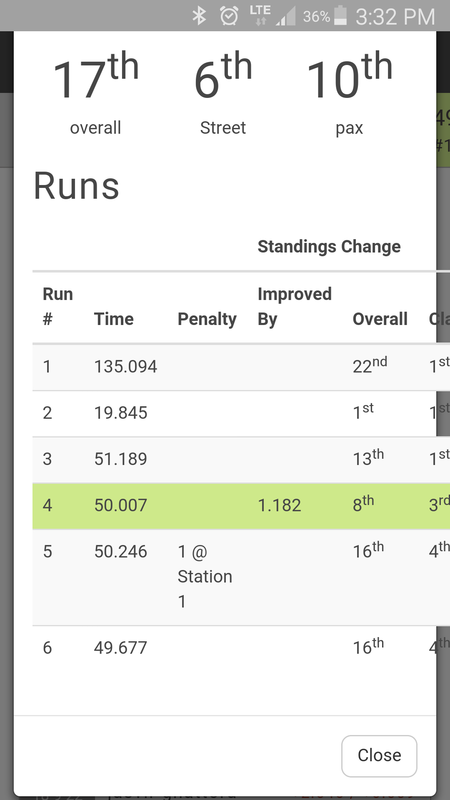 Our club tried using the live results for a few events now. I think we had 2 events plus one driver training "school." We only gave the website address to admin so they could play around and provide feedback. Here it is. Chrome browser on Samsung phone doesn't appear to work at all. The built in browser on my Galaxy S4 (which I never use) worked totally fine. Also Chrome browser on a laptop worked totally fine. So it seems to be just a mobile Chrome browser thing. We had 2 guys with the exact same thing but they had the exact same phones (GS4). See ss 1. Something strange with lingering data. We gave one guy (Mohamed) a fake time of 19 seconds as a placeholder during a timer issue. We scored it as a rerun so it wouldn't count against him. RM correctly ignored this time for his results, but it also assumed he was still top time of day because there was no 1st place as you can see in these screenshots. 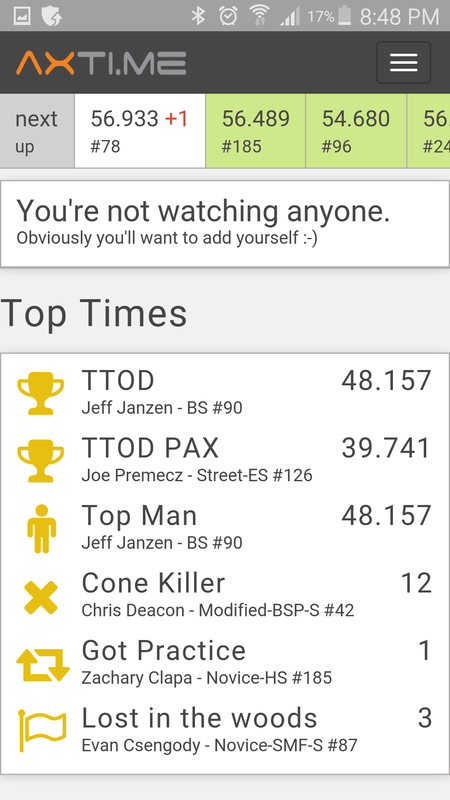 A few guys had questions about the Top Times section. What does Top Man mean? Is that some combo of raw and pax and class? What is Got Practice? Most improved? What is Lost in the Woods? Most DNFs or most variation in times? @canadabeau Thanks for the feedback! For the number 1 ranking no appearing, that is strange. I'm guessing it has to do with the recalculate after the fact. I'm guessing if you refreshed the page, it would be correct. Can you confirm that? You should see the "missing" 1st show up. The missing run is still missing. Here is a link to the old "live" results. One of my guys provided the link. I have no idea where they got it from, as I cannot find it myself. This isn't a huge deal, it's just something strange that might be worth looking into in case the database holds onto that time for something else e.g. for a class trophy or points. The Chrome mobile browser ... I'm not sure what to say. I had it twice (two different events) and I was able to view it on my default mobile browser (just called "Internet" on Samsung GS4). The other guy who had the exact same issue has a GS4 as well. Anyone else on the forums using this phone? Here is a PDF of the live results that are still online. Easier for me to print and make comments on the sheet than try to take a bunch of screenshots. One other thing we noticed. The RM Live site doesn't seem to update any classing info after changes are made. Only driver times are updated. E.g. We bumped all the Street class drivers from AS, BS, CS, etc. all into one "Street" PAX class. In the Axtime results and on our RM software, it appears correct. However, on the Live site, it appears some of the drivers stayed in their own class and were not bumped. For example Jeff Janzen and Rob Rurak are both listed in "BS" not in "Street-BS." This only happens on the live site. Compare the results (here) to the live results (here) to the official results (here). You'll notice that our official results have only 4 PAX classes while the live results have bunch of separate classes. 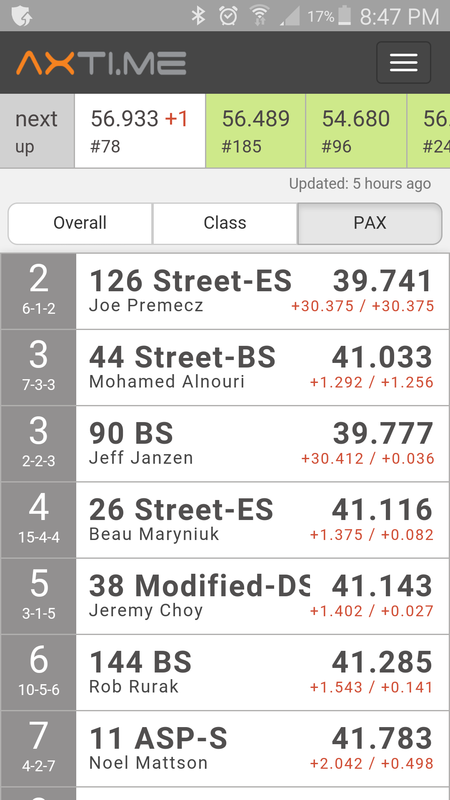 We normally bump all drivers into the 4 PAX classes, but it seems that the live results was using info from partway through registration, so only some drivers were bumped. The Live site doesn't appear to update registration info during the day, almost like it takes a snapshot in the morning and then just used that info all day. Further evidence is that on the Live site, Jim Antosko (#74) appears twice, and Emily Woo (#178) is a DNS. Both of these were fixed before the end of registration and these drivers do not appear on the official results. @canadabeau Were there runs already done before the registration changes? Registration changes should be pushed to rmlive but if Apply to Existing it won't update existing runs uploaded, so you should "Resync" the event from the Event Home screen.